Ceibass Venture Partners – More On Why Deals Come Undone. 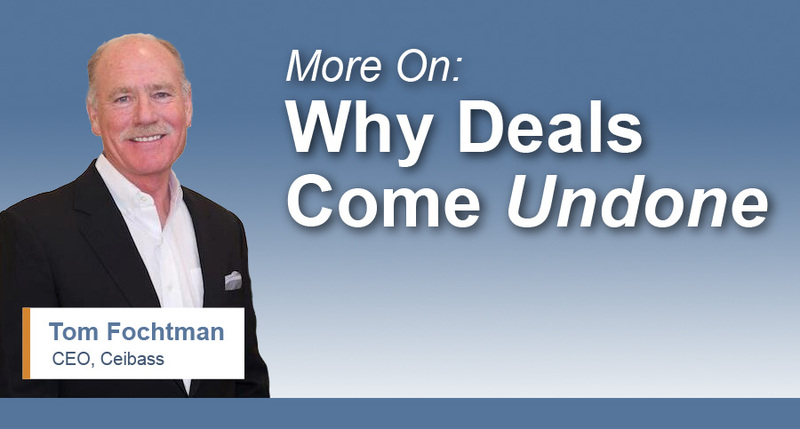 More On Why Deals Come Undone. The Enterprise Value Specialists at Ceibass want you to know some of the common ways lawn & landscape deals come undone. With the knowledge, you can improve your business’ performance and avoid the pitfalls. Too many instances of the companies general accounting and bookkeeping are not in compliance with GAAP (Generally-accepted auditing practices). Big red flag if enough of this occurs. Due Diligence confirms that the company has not kept up with capital expenditures (Capex). It becomes very clear that the equipment is old and the fleet is of high mileage. Work in Progress (WIP) is a mess. Not accurate and worse case the company is pre-billing work. Big red flag if that is uncovered. Have a clean and accurate WIP for companies doing a fair amount of installation work is a must! In general, due diligence is looking under the hood of someone’s car with a microscope! The tougher it is to get the documents needed from the seller, the tougher it is to move forward. Then the quality of the information will determine, in large part, if the buyer is going to continue pursuing the seller. If DD becomes a cluster, they walk. It’s a direct correlation to one’s company not being well run and managed.